Ascension Wisconsin Pharmacy at Ascension St. Mary’s Hospital in Rhinelander is now open. Ascension’s pharmacists do more than stock prescriptions, they collaborate with patients and their care teams and use the latest technology to help streamline treatment and recovery. “We know that accurate, convenient and courteous pharmacy service is an important part of the healthcare experience,” said Stephen Shuda, manager of pharmacy services for Ascension Wisconsin. Located just inside the main entrance of Ascension St. Mary’s Hospital and Ascension Medical Group in Rhinelander at 2251 North Shore Drive, the North Woods’ newest pharmacy is open from 8:30 a.m. to 5 p.m., Mondays through Fridays. The pharmacy accepts prescriptions from all providers and most major insurance plans. While the Ascension Pharmacy at Ascension St. Mary’s is new, several familiar faces will greet customers to help meet prescription or over-the-counter needs. Lead pharmacist Tabitha Bennish is from Gleason and attended Merrill High School. She attended UW-Madison, where she received both her Bachelor of Nutritional Sciences and Doctor of Pharmacy degrees. She previously served the residents of Rhinelander at Stoxen pharmacy and the Hometown pharmacies. Discharge Pharmacist Allison Grafwallner hails from Conover and graduated from Northland Pines High School. She received her Doctor of Pharmacy degree from Concordia University-Wisconsin. 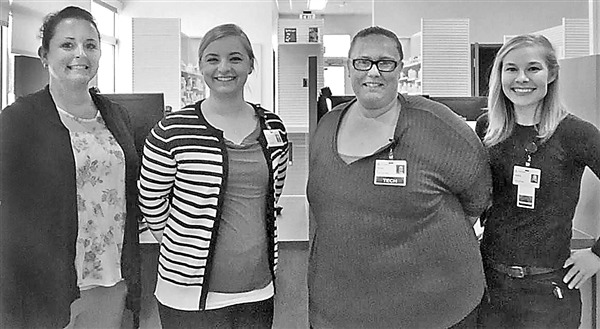 Pharmacy technicians Robynn Marten and Ashley Salzman have been long-time residents of Rhinelander and grew up locally. Salzman recently worked for a local veterinary pharmacy, while Marten had a previous role at Ascension St. Mary’s in Rhinelander. The Ascension Wisconsin Pharmacy at Ascension St. Mary’s participates in the Dispensary of Hope; Nick’s Law for Drug Repository along with referral support for Ascensions Prescription Assistance Program to help patients in need get access to their medications. A 24-hour refill request line is available. The Ascension Wisconsin Pharmacy in Rhinelander is the second full-service pharmacy operated by Ascension Wisconsin to open in central and northern Wisconsin. A similar location at Ascension Medical Group at Westwood in Wausau opened in 2017. Fifteen other Ascension-owned pharmacies are operating in Wisconsin along with 65 across the United States. For more information on the Ascension Wisconsin Pharmacy at Ascension St. Mary’s, call (715) 361-4770.